For people/groups offering Chow Chow rescue and help. Re: Chow rescue in Texas? And when my time comes I will not go alone for my Chows will be there to say "Welcome Home". I know that this is a little old, but West Texas Chow Rescue IS still doing rescue, just on a reduced scale. I just adopted my latest addition to the family from them in June 2011. AlwaysTango wrote: I know that this is a little old, but West Texas Chow Rescue IS still doing rescue, just on a reduced scale. I just adopted my latest addition to the family from them in June 2011. They just started their rescue back again a few months ago. For a long while they weren't doing rescue. I used to be very involved with WTCCR when I lived there, and most of my babies have come from Linda. They do a lot of good work. I was just afraid that someone might see this thread and not realize they are currently doing rescues again. I just wanted everyone to know that they were back in the rescue business. How do you contact West Texas Chow Rescue? Their website does not have any contact information listed that I could find. It lists their animals up for adoption and says send an email but I see no e-mail address. Someone just linked me to a chow mom and two pups that are only available to rescue and I wanted to see if they could take them on. In one of the about posts there is a rescue and a Chow member Phyllis helps with Chows. I have adopted a chow from Tejas Rescued Pet Adoptions a few yrs ago . now I got 2 more chows and i have a big yard they love my family. Houston Chow Chow Connection is another that is up and operating. 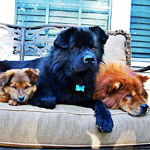 Yes, Houston Chow Chow Connection is awesome & help so many Chows! If you are looking for a new friend please check them out! I'll pipe in and say that I have had great luck and been able to help North Texas Chow Chow Haven 817-721-5748. The lady that runs this rescue is Dawn Brown, and she is great with helping you find your perfect match Chow Chow. She does have a FaceBook page: https://www.facebook.com/northtexaschowchowhaven.org/ She answers quickly if you call, email or FaceBook message her.